This is what NASA’s Insight lander looks like on Mars. With its solar panels, InSight is about the size of a small bus. Insight successfully landed on Mars in November with a main objective to detect seismic activity. 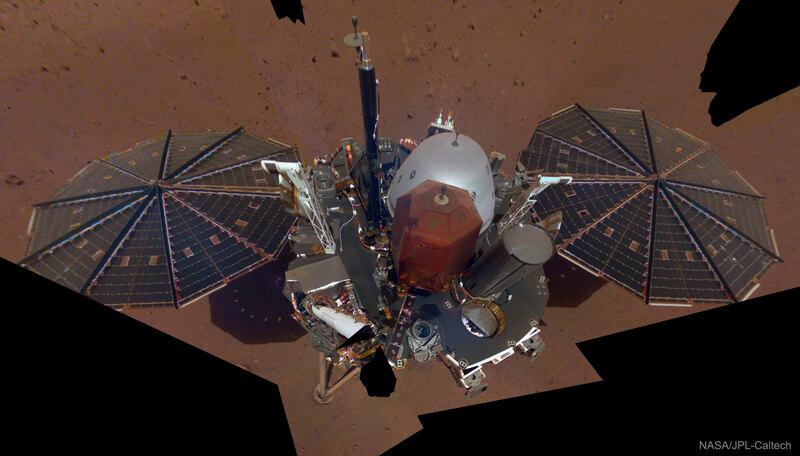 The featured selfie is a compilation of several images taken of different parts of the InSight lander, by the lander’s arm, at different times. SEIS, the orange-domed seismometer seen near the image center last month, has now been placed on the Martian surface. With this selfie, Mars InSight continues a long tradition of robotic spacecraft on Mars taking and returning images of themselves, including Viking, Sojourner, Pathfinder, Spirit, Opportunity, Phoenix, and Curiosity. Data taken by Mars Insight is expected to give humanity unprecedented data involving the interior of Mars, a region thought to harbor formation clues not only about Mars, but Earth.